6.1.3.1 Overview. The eco-efficiency analysis is one of our most important tools for implementing the principles of Sustainable Development in BASF. The key question is "What should the products of the future look like?" For this purpose, BASF, together with an external partner, began to develop the instrument of eco-efficiency analysis as early as 1996. In the meantime, the method has matured and around 200 products and production processes have been analyzed to date. Eco-efficiency analysis makes it possible to consider economy and ecology side by side in the development and optimization of products and processes and to select the most eco-efficient alternative. The objective is to identify products combining optimum application properties and good environmental performance at lowest possible cost. The analysis yields clear indications of possible improvements in the products and processes employed. Scenarios and variants enable us to show the distance between potential new products and existing solutions. Eco-efficiency analysis is a strategic instrument for BASF. Strategies are developed for sustainable analyses of our product lines and support is provided for decisions on capital expenditures. Fifty percent of the eco-efficiency analyses conducted to date have been used for internal strategy and research decisions. The other half of the analyses has been carried out in cooperation with external partners such as customers, NGOs, and governmental institutions. Right from the beginning the eco-efficiency analysis was discussed in public. This has led to many valuable contributions from external parties and has put the method at a high level of acceptance throughout various industries and stakeholders. 6.1.3.2 The Methodology. The first step of an eco-efficiency analysis is the definition of a specific customer benefit (Saling et al., 2002). The analysis then compares economic and ecological advantages and disadvantages across several product or process solutions that can fulfill the same function for customers. This means that products are not compared with one another in overall terms but rather their application performance such as "painting a square meter of furniture front" or "reductive cleaning for 1000 kg dyed polyester." The eco-efficiency analysis focuses on each phase of a product's lifecycle "from cradle to grave," beginning with the extraction of raw materials from the Earth and ending with recycling or waste treatment after use. 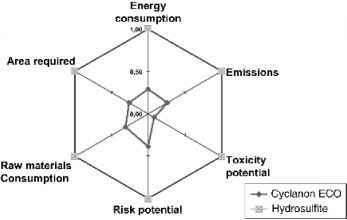 The basis is a lifecycle analysis according to standard ISO 14040 and the following. In this way, the environmental impact of the products used by BASF as well as of the starting materials produced by others is measured. The usage behavior of the final consumers together with the various possibilities for reuse and disposal are also analyzed. In addition, a comprehensive economic assessment is performed, including all costs incurred in manufacturing or use of a product. The economic analysis and the overall environmental impact are then combined to evaluate the eco-efficiency. Thus, all relevant decision factors are analyzed with specific customer benefits always being the focus of attention. Eco-efficient solutions to the problems are those that provide a better customer benefit from a cost and environmental point of view. • a new process based on Cyclanon® ECO, a liquid reductive agent. In the hydrosulfite process, the dye bath is discharged after dyeing and hydrosulfite is added in an alkaline solution. After reductive cleaning two rinsing steps are necessary. A neutralizing step finishes the process. When using Cyclanon ECO, the reductive cleaning is performed in the exhausted dye bath itself without changing the pH. After completion of the reductive step one additional rinsing bath is sufficient to complete the process. 6.1.3.4 The Indicators. The representation of a multiplicity of individual results from the actual lifecycle assessment is frequently opaque and difficult to interpret. To improve the interpretation of results, BASF has developed a method that combines the ecological and economic parameters, plotting them as a single point in a coordinate system. • potential for misuse and hazard potential. Each of these categories covers a large number of detailed individual criteria. In the ecological fingerprint the alternative with the highest impact is assigned a value of one; all others are evaluated relative to this - the further inward an alternative is located, the better it is. The ecological fingerprint of the study about reductive cleaning of polyester clearly shows the low environmental impact of the new process. In all environmental categories the new process shows enormous improvements (Fig. 6.4). The advantages are based on reduced consumption of water, reduced consumption of chemicals, and reduced water emissions. The overall environmental impact of a product or process is given by the combination of the individual data sets. After normalization as described above, the next step is to combine the normalized values via a weighting scheme to form a single value for the ecological impact. This weighting scheme is made up of societal weighting factors and so-called relevance factors. Figure 6.4. The ecological fingerprint. Figure 6.5. 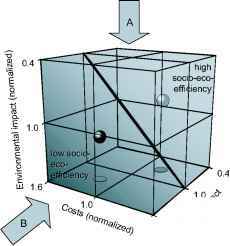 Societal weighting factors in eco-efficiency analysis. factors. This way, both qualitative factors influenced by society as well as quantitative factors based on actual environmental data are used. Economy. The economic data are compiled over the entire lifecycle. For this purpose the material and energy flows, including all relevant incidental flows, are taken into consideration. The total costs are normalized with respect to the average of all alternatives. This helps in identifying cost drivers and areas offering potential for cost reductions. • fewer chemicals, reduced number of controls, and as a consequence fewer possibilities for errors. The savings of water and the reduced process costs dominate and easily compensate for the higher costs for chemicals. 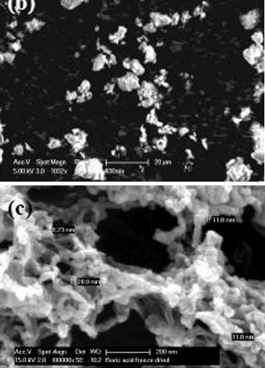 Figure 6.6. 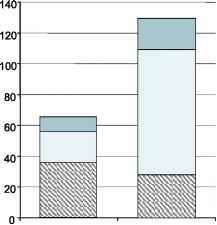 Comparison of total costs. same number are deemed equally eco-efficient. This can, however, be achieved by different combinations of the individual economic and environmental numbers. The eco-efficiency portfolio of the example clearly presents the advantages of the new process (Fig. 6.7). The process is the more eco-efficient alternative and is positioned in the upper right-hand corner. 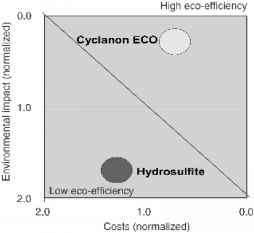 Costs and environmental impact are lower than for the process based on hydrosulfite. Figure 6.7. The eco-efficiency portfolio. of a city of six million inhabitants would be saved each year (Dittrich-Kramer et al., 2002). 6.1.3.6 The Value of Eco-Efficiency Analyses. The value of the eco-efficiency analysis tool, apart from its description of the current state, results from the recognition of dominant influences and the illustration of "what if...?" scenarios. The stability of the results is verified by means of sensitivity analyses in every project. Underlying assumptions as well as system boundaries and societal weighting factors are varied and checked within realistic ranges. The results of an eco-efficiency analysis make it possible to identify weaknesses in products and processes over the entire lifecycle. This allows us to identify factors with significant optimization potentials. Eco-efficiency analysis permits a condensed representation of complex interrelationships, which, as a result, are easier to grasp and to understand. Often, the facts and implications of a case are only vaguely understood. 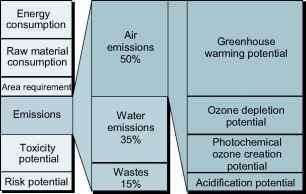 The results of an eco-efficiency analysis allow the visual presentation of these facts and provide a sound basis for discussion. Moreover, the detailed information gained from the investigations enables a more targeted technical, ecological, and economic development of the products and processes. From a user's perspective, the understanding of costs and various environmental aspects of a product is often of a relatively subjective nature. The eco-efficiency analysis illustrates these aspects and makes them more readily accessible for discussion. BASF also values the method as a tool for cooperation with customers. Joint projects can reveal improvement potentials, which will in turn realize a multiple-win situation; the winners being the customers, the retailers, the end-users, BASF, health, and environment. With regard to the markets of the future, we believe it is important to consider the environmental impact of products. We are convinced that eco-efficient products and processes give our partners and us a competitive edge. 6.1.3.7 Further Enhancing the Eco-Efficiency Analysis by Including Social Aspects. Whereas numerous instruments are used in practice for the ecological assessment of products and processes, social lifecycle assessment procedures are still lacking. BASF is cooperating with Karlsruhe University and the Oko-Institut e. V., Germany, in developing a method to include and measure social aspects of sustainability in a lifecycle assessment. The activities are integrated in the Project "Sustainable Aromats Chemistry" of the German secretary for education. The new method, the so-called SEEbalance®, examines and compares three main aspects of different product or process alternatives: costs, environmental impact, and social effects. Socio-eco-efficient solutions combine a good environmental performance with high social benefit and low costs for the customer. For the SEEbalance, the well-proven principles of the BASF eco-efficiency analysis were enhanced by a product-related specification of the social dimension of sustainable development. Various organizations (several UN organizations, national governments, nongovernmental organizations, scientific institutes, private enterprise organizations) have already formulated specific social development goals and, in many cases, also indicators to measure them. We first reviewed the existing social assessment criteria by a check of literature and other references. In a second step, it was examined which of these social goals are relevant for and applicable to product and process assessment. Viable social indicators need to be suitable for the lifecycle assessment and for building up specific databases. Ecologically relevant inputs and outputs are usually easily related to one product unit (usually 1 kg or 1 MJ) and can therefore be cataloged and found in special lifecycle assessment databases. This, so far, has not been the case for social aspects. Correspondingly, no such databases exist from which useful data could be extracted. A possible approach for developing social indices (e.g., the number of occupational accidents or the number of employees) is based on an assessment of entire industrial sectors. For this, statistical data on social indices from various branches of the economy are linked to the amount of manufactured goods in the respective branches, and thus can be related to product units. Analog to the ecological and economical dimension, the social factors are also based on a lifecycle view. In order to generate the final assessment, the individual results for the relevant social indicators must be aggregated. Owing to the varying importance of the different indicators, each indicator has to be weighted to determine its influence on the result. Similar to the existing eco-efficiency analysis, weighting of the indicators includes "relevance weighting factors" and "societal weighting factors". The result is then presented as social fingerprint (Fig. 6.8). Finally, the results of the social, ecological, and economic assessments are combined in the three-dimensional portfolio, the so- called SEEcube® (Fig. 6.9). The instrument described here is to be regarded as "work in progress," that is, it needs to be constantly and critically reviewed and adjusted to the ongoing developments in society and the discussions in politics, society, and science. Figure 6.8. The social fingerprint.